Posted August 24, 2015 by Tony Jones & filed under Books. 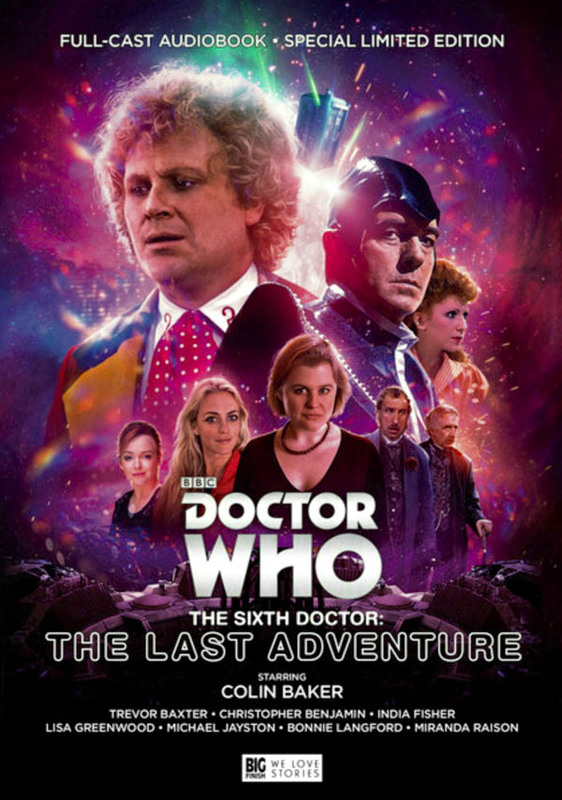 Big Finish has treated us to something very special in the form of ‘The Sixth Doctor – The Last Adventure’. Brought forward from September, this is a four-disc story telling how the Valeyard (Michael Jayston) schemes across the Sixth Doctor’s (Colin Baker) incarnation. We know in advance that this is the story which will regenerate the Sixth Doctor played by Colin (the TV episode had Sylvester McCoy in a wig), so this is no minor release. Each disc takes us through a story with a different companion. Sadly it isn’t possible to bring Evelyn Smythe (played by the late Maggie Stables) back for this special release, and neither did Nicola Bryant get to reprise Peri Brown. The set starts with a story written by Simon Barnard and Paul Morris, ‘The End of the Line’. We get to hear new companion Constance Clarke, a WREN from Bletchley Park played by Miranda Raison, for the first time (she is introduced in September). What else can you expect with time travel? The tale is moody and intriguing and sets the tone for the rest of the set. Second up is a story for another Big Finish companion. Charley Pollard, as played again by India Fisher (see ‘Foreshadowing’ above) who very greedily travelled with both the Eight and Sixth Doctors. This is a layered tale called ‘The Red House’ from Alan Barnes, who gives us a tale of werewolves and time lord intrigue. Third up Matt Fitton pulls out the stops for ‘Stage Fright’. Not only are we treated to the admirable talents of Christopher Benjamin and Trevor Baxter as Jago & Litefoot, but they are played against the very modern Philippa Jackson (Flip to her friends and fans) played by Lisa Greenwood. Jago & Litefoot originally met the Fourth Doctor in the TV story ‘The Talons of Weng-Chiang’ and Big Finish later had them spend some time with the Sixth Doctor. So, we have Victorian London, the infernal investigators Jago & Litefoot, Flip and the Doctor. Add in tavern owner Ellie Higson (Lisa Bowerman), several wannabe actors and the Valeyard and you have the recipe for entertainment. Matt provides all the players with some moving scenes and memorable dialogue – some of Flip’s lines when Sixie explains the Valeyard (and regeneration) are cry-out-loud funny. Sadly it all comes to a noble ending and Bonnie Langford treads the boards again as Mel Bush in the Nick Briggs story ‘The Brink of Death’. Nick squeezes in another intriguing almost-companion in the form of Genesta, played by Liz White. The story doesn’t let the ending get in the way of quality story-telling and the set is highly recommended. Out now from Big Finish. > Follow Tony Jones on Twitter. As a big fan of the both 6th Doctor and Colin Baker I’m extremely pleased that this has been done. It’s disgraceful how he left the show – a proper final story is what he needs and what he deserves.